I love a quick and fun ride. They keep me going when I’m slammed with work. A top notch quick ride for me is usually anything under two hours, some nice views, and a few twists in the road if possible. 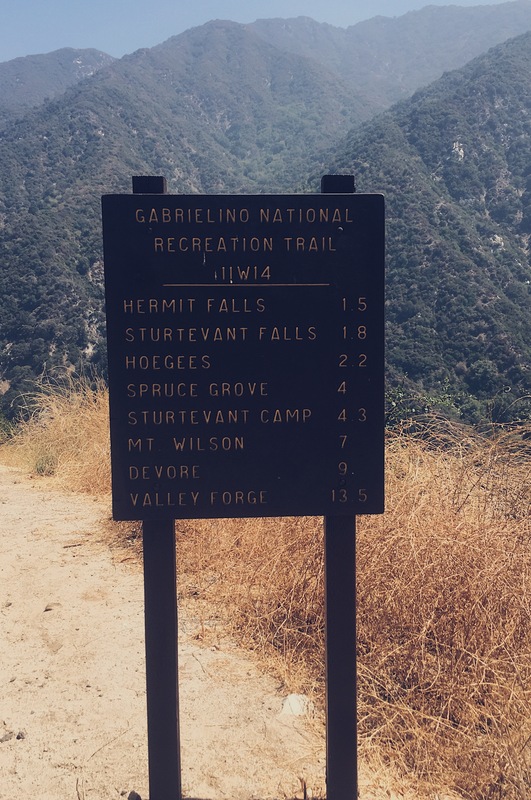 Last weekend, I did a trip up to the San Gabriel Mountains to Hermit Falls – because what’s better than a quick ride? Answer – a quick ride plus a quick hike. What can I say, I like to get the most bang for my buck. The route I took was pretty straight forward from Mid City, Los Angeles. I jumped onto CA – 2 N, merged onto CA – 134 E, then I – 210 E, Exited at number 32, turned left onto N. Santa Anita Ave, and finally right onto Santa Anita Canyon Rd. I realize this sounds like a lot of freeway, but it wasn’t so bad as I left early in the morning. Plus, there are some nice views overlooking the city on CA-134. Once I got onto Santa Anita Canyon Road things got a lot more fun. There were some nice twisty turns on this road and views. There were a few sharp turns, but not many. I thought the road could’ve been a little cleaner – there was a bit of loose gravel and rocks down on the road when I went. If a rider wasn’t paying attention they could have issues with the debris. However, I feel like there’s enough traffic flow and rangers nearby to prevent any large rocks from just squatting in the road. I arrived at the mountain at about 10am. While there wasn’t much clutter on the road up the mountain, I soon discovered that was because the early birds had already arrived and taken all the parking spots. At the top of the mountain there’s a ranger station and two parking lots. However, you have to pay or have a permit of some sort. I ended up turning around going back down and squeezing in between two cars packed along the street. I did find it strange that I didn’t see any motorcycles on this road until I was leaving. I’ve been up to the San Gabriel Mountains before and I know it’s a popular location for riders. So, I was surprised to be the only rider on the mountain that day. On the flip side, there were lots of cars on the mountain. Unlike when I’m up in Malibu, these drivers weren’t trying to prove anything or speed, they were just trying to enjoy the drive along the mountain. So, if you’re looking for a relaxed ride through the San Gabriel Mountains, I’d highly recommend this adventure. If you decide to throw the hike in for good measure, I’d make sure to arrive around 8am to secure a good parking spot.